A rite of passage from summer to fall, these cookies were a favorite growing up. 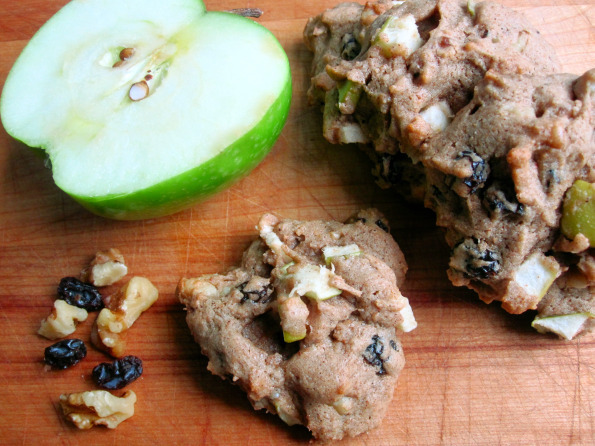 They are autumn spiced and full of good stuff like apples, raisins and walnuts. I can remember helping my mom stir the batter. It gets really stiff at the end. We’d take turns. These delicious, cakey cookies were worth the extra effort. I think my favorite thing about these cookies are the strong flavors of clove and nutmeg. These two spices, who usually are back up singers to cinnamon, have equal footing in this cookie. Totally delicious and a little unexpected. These are almost breakfast approved. I mean, you want to start you day off with cookies but you don’t want to start your day off with fiber-free sugar discs that will have you either hungry again or needing a nap by 10am. To make these more of a contender, I’d add a cup of quick cooking oats, and maybe up the liquid to a half cup. Keep the sugar and everything else the same. I have yet to do this! It would be an experiment but I think it would work! With the oats, fruit and nuts, you could have these for breakfast without getting on a sugar roller coaster. Bonuses: totally portable and considerably less expensive than those other breakfast cookies. I never am sure what apple to use in baking. I used the one my mom is a fan of — the classic Granny Smith. The tartness of it with the brown sugar was excellent. 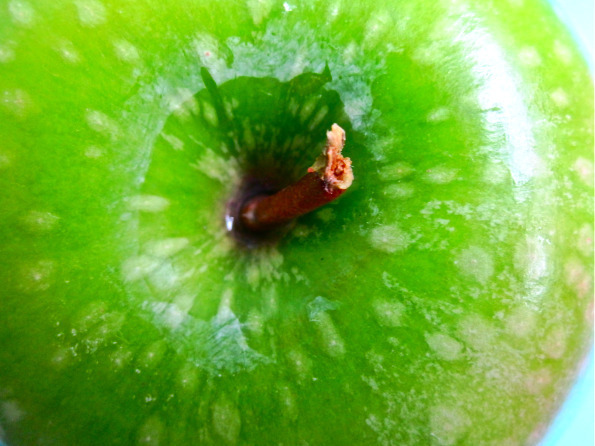 If you use a sweeter apple I bet you could cut the sugar down by a quarter cup. I am not a fan of overly sweet cookies — which most cookies are. I typically cut at least 1/2 cup sugar from any cookie recipe and the resulting cookies still bake up fine and are plenty sweet. I did that to this recipe! Still delicious! I hope you like these little bites of fall as much as I do. Here’s to favorite sweaters! Sift flour, baking soda, salt, and spices together. Cream butter and brown sugar. Add milk. Incorporate. Add egg. Beat until fluffy. Add fruit and nuts and stir. This is where it gets hard to stir. I used a Kitchen-Aid so it was no problem. But if you want a little arm strength training while baking cookies — the ultimate in multi-tasking — have at it! Drop from spoon on greased or parchment lined cookie sheet. Bake 12 minutes. This entry was written by haikugirl, posted on September 27, 2010 at 11:50 am, filed under Baking, Cookies and Bars, Vegan Friendly. Bookmark the permalink. Follow any comments here with the RSS feed for this post. Post a comment or leave a trackback: Trackback URL. 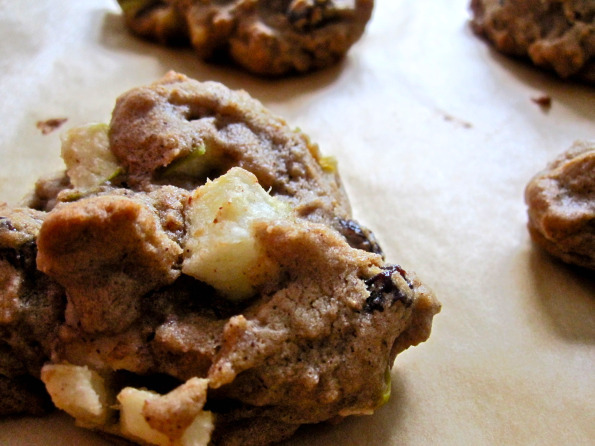 Mmmm fresh apples in a cookie… genius!! With the warm spices and walnuts too!! Yum! !